MAD TO THE BONE: At 89, Al Jaffee is the longest-running contributor to Mad magazine--he even credits his 55-year tenure at the satirical mag with keeping him kicky (“Serious people my age are dead,” he famously told Mother Jones earlier this year). 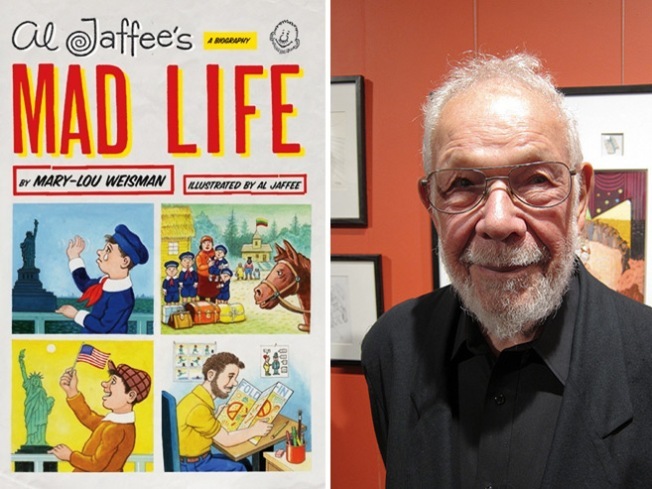 He’ll be at the Strand tonight, where he’ll be interviewed by journalist/author Mary-Lou Weisman about her recent biography Al Jaffee’s Mad Life. 7PM. A STEAL: Rififi in Tokyo (1963) is one of those odd movies that acknowledges it’s ripping off a previous work (in this case, the source material is Jules Dassin’s exquisite heist flick Rififi) without exactly being a remake, and also while having its own aspirations to greatness. Jacques Delray’s story of a jewel heist (the gem is so big, it’s called Titan) from the Bank of Tokyo is certainly a rollicking ride. Part of The Heist series at Film Forum, 5:35, 9:40PM. BOROUGH HAUL: While restos on the isle of Manhattan (and parts of Brooklyn) continue to bash away at heritage pork and “market” menus (not that there’s anything wrong with that), the humble eateries of Sunnyside, Queens continue to feed the locals and those intrepid enough to head east for dinner. At the Taste of Sunnyside event, you’ll get just that: 20+ restaurants serving up the dishes that have garnered loyal followings in the upper 718 and beyond. And it’s just $20. Master Billiards and Café, 6PM.